Wish you very happy and prosperous New Year! God bless you with long life and good health, to save the community for years to come. 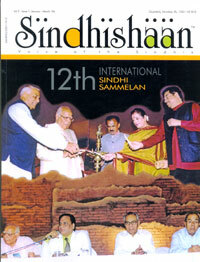 I attended the '12th International Sindhi Sammelan' at Mumbai. It was indeed big show and well attended too. I am happy to attend. The credit for success goes to you trio, who could spare time and did hard work. Once again, your efforts have been successful in respect of Ulhasnagar matter. I congratulate you for that. Please keep it up till the end. Now, you have embarked on yet another mission to organize Sindhis on one platform. I wish you success.